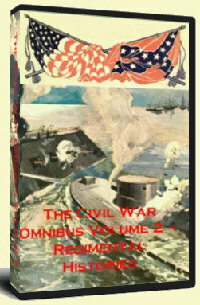 The Civil War Omnibus represents the largest collection of late 19th to early 20th Century books about the Civil war. Each volume of the Omnibus contains several CDs pertaining to one topic. A new volume is published once every three to four weeks and the entire omnibus will represent approximately 1,000 books when completed. 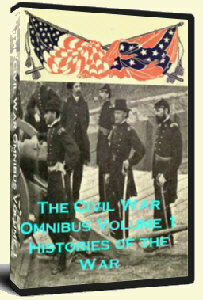 Volume 1 - Histories of the Civil War is comprised of 40 different books and book series related to the Civil War on eight CDs. and many more volumes related to the history of the Civil War. View the full index of Volume 1 for full details. All books are in PDF or DJVU format and each CD in the collection contains a simple navigational index to the books on that cd as well as a full index to all eight CDs. Each CD also includes a DJVU viewer for both Windows and Macintosh computers. View the full index of Volume 1 for full details. View the full index of Volume 2 for full details. 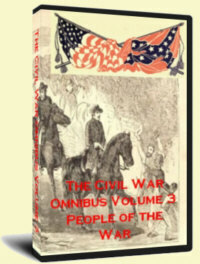 Volume 3 - People of the Civil War is comprised of over 300+ books and series pertaining to the the people of the Civil War. In addition to many books on Lincoln, Jefferson and the mor famous figures of the Civil War is a large collection of books portraying less well known but still important people who made up the history of the Civil War. View the full index of Volume 3 for full details.